The Tarot is often considered older than it’s apparent history. Although no documents exist prior to the 18th century of the Tarot being used as an oracle, divination using similar cards may be found as early as 1540; The Oracles of Francesco Marcolino da Forli shows a simple method of divination using regular playing cards. In 1735 (The Square of Sevens) and 1750 (Pratesi Cartomancer) rudimentary divinatory meanings and lay outs for the Tarot may be found. The oldest surviving Tarot Cards are three early to mid 15th century sets, all made for members of the Visconti family, however their suites and Major Arcana are only similar in construction to what is viewed as the modern decks of the 20th and 21rst century. In the 1880s the Golden Dawn assembled many variations and mystical systems to produce a deck that was synchronized with multiple western and mid eastern traditions. In my study of the Tarot I have focused on the Kabalah and Western European traditions as a basis of understanding the system. The Tarot represents several layers of perception to the world around us and how we interact and discover ourselves. One day I accidentally dropped a deck of Tarot Cards and saw how they fell into a random pattern. Because of their shape I couldn’t see much of the deck as the cards were covering the images beneath and wondered how a reading would be done if one could see how the images would interface with each other. I made a decision to develop jewelry focusing on spiritual and metaphysical subjects, bringing these ideas to the hand and eye. I then undertook a labor to produce a Three Dimensional Tarot system completed in 1992: the Tarot Casters. 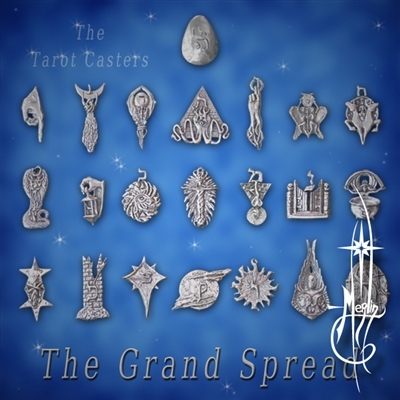 The Tarot Casters comprises of the major Arcana’s 22 concepts, each shape unique, each interpretation of the card an original design. I based the pieces on Hebrew letters assigned and extrapolated the classic design of the card. The result is a deck of 22 pieces that may be held in the hands and dropped on a surface. Then the querent looks at the random design and (like a rorschach blot) interpret the design. The reader then interprets the shape by the sum of it’s components: the flow of element and concept from one piece to the other. A project in this field is the Tarot Garden in MetaPlace (now closed). I created a Virtual Reality featuring the Tarot Casters as garden sculpture. Each piece is in its own environment including tone, animation and short videos to help illustrate the concept of each card in a new kind of environment. The first section is the Court Yard where one is introduced to the Garden with a series of helpful hints and instructions on how to interact. This includes a fully animated video that introduces the Tree of Life: the foundation of the Tarot as perceived by most Tarot Students of the 21rst century. From there it separates into three gardens, actually producing “the Fools Journey” as the Major Arana is sometimes referred to. That Tarot is a living system, we learn from the Tarot by discovering ourselves, other people and the environment that surrounds us. I invite you to examine my work and respond with your impressions.